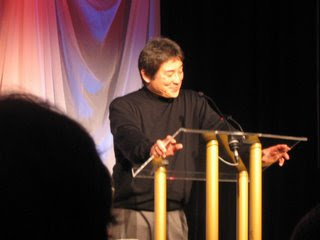 As mentioned the other day, Guy Kawasaki was the keynote speaker at the OSTEC 2007 Silicon Vineyard Innovation Awards here in Kelowna. The man is brilliant... that is really all I have to say. Even though he was in pain due to "an upper body injury" suffered from a hockey game last week, he was a real trooper and gave an amazing speech. (If he was this good when he is not feeling well, I wonder what he's like when he's 100%?). I was amazed by his knowledge of hockey and love for Canada. He started his speech with a comparison to Mark Messier saying that "Messier wouldn't let a little pain stop him from doing his job on the ice..." Guy went on to present his bio in the next few minutes and then jumped into his discussion about innovation illustrating key points from his "The Art of the Start" book. Make Meaning - don't start a venture to just make money. Make meaning, create something that makes the world a better place. Make Mantra - forget about mission statements as they tend to be wordy, long and boring. One of the examples that Guy mentioned that illustrates a good mantra was "Authentic athletic performance" by Nike ("Just Do It" is their tagline). Get Going - don't focus on creating a business plan, or a Powerpoint presentation, simply implement. You should always be selling and not strategizing about selling. Think big, find "partners" to share your passion, don't worry what everyone thinks. Guy referred to this as "polarizing people". Guy I want to thank you for a great keynote. You were every bit entertaining and inspirational as I had hoped and more!! You exude confidence and positivity. Thanks for coming to Kelowna. We hope that you'll visit us again. You are turly an inspiration... so much so that I am writing this post at 1:15 am in the morning... I have to get up in six hours and finish packing and move into my new home. Sheesh it's going to be a fun day of moving tomorrow. I want to thank Enquiro for co-sponsoring Guy's keynote. Thanks to Manoj Jasra for the pics. I'll leave you with a great quote from "The Art of the Start"